We carry a full range of Taper Lock Bushes, bored and keyed to both metric and inch sizes, ready to go straight on to your machine. The Taper bush is designed to give rapid assembly and dismantling of the pulley and other transmission equipment with no special tool requirement except hexagonal key. The large range of finished bores available ensures that an immediate assembly can be made thus avoiding costly factory down-time. The bushes are machined with keyways in accordance with British Standard specifications. 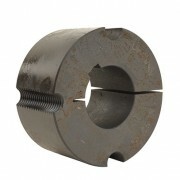 This is in addition to clamping screws which, in many cases, are sufficient to meet the required torque. Fastening by taper bushes allows the removal of any clearance between hub and bore so that fretting corrosion is eliminated.